Baptism is the way we join the Christian family (the Church) and are made Christians. This is why it is also called Christening. – the inward gift given by God. – Everyone is baptised by having water poured over them. God’s gift is his Holy Spirit. This is too wonderful for us to explain in any one way, so we use many different pictures to help us see what God is doing for us in baptism: he forgives our sin, we are born again, he makes us his children, we inherit his kingdom. We baptise people because it is the way God has chosen for men, women and children to join the Christian family and begin the Christian life. Jesus commanded it, Saint Peter and the apostles obeyed, and the Church has continued to do so ever since. Whom do I contact to arrange the baptism? The Rector, Father Robert, is responsible for organizing the service. Click here, for details of how to contact him. Who can be baptised at S Helen’s? Anyone can be baptised who is living in the parish of S Helen’s or who has strong links with the church, for example a regular attender of services at S Helen’s. If you’re not sure if you live in the parish it is best to email or phone the Rector. What is the cost of the baptism ceremony? The service of baptism is free, but if you would like to make a donation to the church it would be kindly received. The godparents must be baptised, and preferably confirmed, before they can carry out their duties. Families are most welcome here at S Helen’s. We ask those in the baptism party who are not regular churchgoers to be respectful of the service in progress and the worshippers around them. You are more than welcome to join us for coffee in the parish room after the service so we can welcome you to the Church. 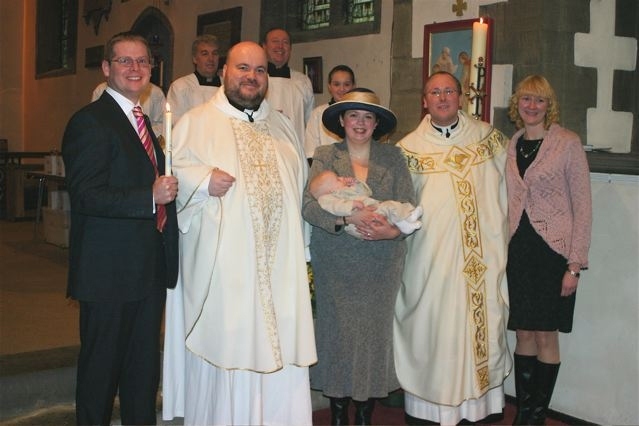 More information about baptism is published by the Church of England.